This isn’t the first time that Cardoza has been on this list. He’s just one of two players to be on the list last year and again this season. It shouldn’t be much of a surprise either if you’ve seen him play at all. His ability to be a constant presence on the defensive side and then quickly transition and get involved in the offense is what separates him apart from the rest. His soccer IQ is very high and on display when he has the ball at his feet. Whether it’s threading the needle with through balls or deciding to take a chance on goal himself, he always seems to make the right play. Attleboro’s goalkeeper had a breakout season during 2016 and earned HockomockSports.com Best XI honors in his first year as a starter. He had nine shutouts and just 21 goals against in 20 games. His ability to control the entire area makes him an elite keeper, controlling crosses or services into the area very well. He showed his ability to react quickly as well, constantly getting at least a hand on shots on target. The biggest challenge this season for Hasenfus will be the change of central defenders after the Bombardiers graduated both Harry Lancaster and Tyler Treichler from its back line. The Hornets graduated a couple of key pieces to a team that challenged for the Kelley-Rex title and made the state tournament again last season. But two players back that will play important roles for Mansfield are twin brothers Nick and Sam Hyland. Nick had a strong season defensively last year but will be counted on more with the departure of Max Gurnon. His size gives him an advantage defending set pieces and crosses into the area and can also play out of the back with his feet. Sam really emerged as a top option in the center of the pitch last season. He is calm with the ball at his feet which allows him to pick out teammates going forward, or even back to help the Hornets keep possession. Kantor had a tremendous sophomore season and was a big reason why Sharon was able to clinch its first league title since 1994. He routinely made tough saves, and often times made the tough stops look easy. He’s quick off his line, which allows Sharon’s back line to relax a little knowing he will be there to clean anything dropped in behind them. Now as a junior, look for Kantor to take commanding control of the area and really handle crosses and services with confidence. You have to think that with the more experience that Kantor gets, the better goalie he will become. Anyone who saw King Philip play a year ago knows just how important Mann was for the Kelley-Rex division champs. Mann is just one of two players to make this list for a second year, joining Oliver Ames’ Nathaniel Cardoza. Mann’s versatility is what really makes him stand out among his peers. If the Warriors need a goal, expect Mann to take up a higher role and make an impact, especially in one on one situations. If the Warriors are looking for possession or distribution out of the middle, the 2016 HockomockSports.com Player of the Year can drop back some and be more of a playmaker. The first word that comes to mind when you think of Melo is skill. He is certainly one of the best players in the league when it comes to having the ball his feet. Whether he needs a simple touch to beat a defender, or maybe one to shield off a defender, Melo is very intelligent with the ball. He isn’t going to be one of the fastest or strongest players in the league, but opposing defenses aren’t going to want to give him much space, especially in the attacking third. Expect Melo to become more of an on-field leader this season for the Black Knights. It’s safe to say Mullins was one of the biggest surprises during the 2016 season. While he played plenty of minutes during his sophomore season, it wasn’t until last year that Mullins really became a consistent playmaker for the Warriors. Patrolling the center of the pitch, his ability to win the ball and hold off defenders boils down to his strength and IQ. Not many players are able to hold the ball or win the ball in tough challenges like Mullins can. He also showed last year his ability to play through balls and balls over the top to spring the Warriors’ strikers. Pinhancos is one of the most technically gifted players in the league. From his center midfield position, he is a true field general that helps the Rocketeers transition from defense to offense. He can also get forward and be an impactful striker for Big Red (five goals and three assists in 2016). Last year, because of his service ability and high soccer IQ, he was responsible for all of North Attleboro’s set pieces and corner kicks. His ability to put the ball into dangerous spots will certainly result in scoring chances for the Rocketeers this season. 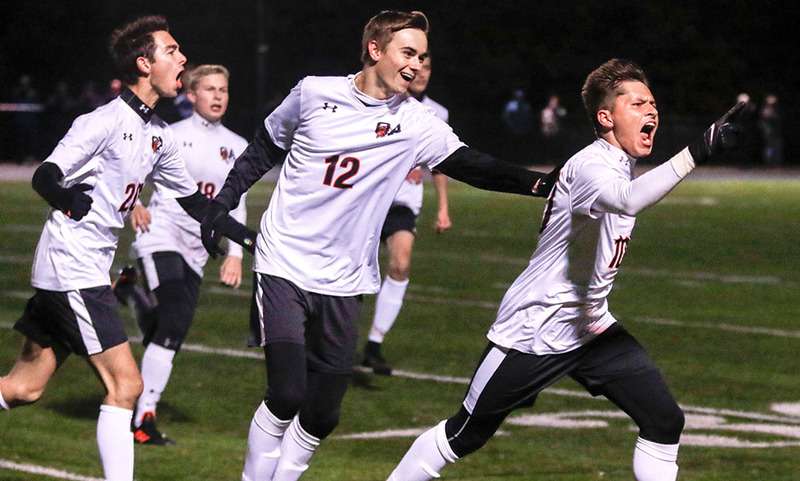 Two seasons ago when Oliver Ames won its first state title, the Tigers had a handful of players from the Class of 2018 play a vital role. Cam Vella is one of those seniors that had a big hand as a sophomore. Now the Tigers will be looking to make it back to that point with those sophomores now leading the way as seniors. Vella’s aerial ability is a huge plus for the Tigers, especially winning 50/50 balls in the midfield. He also can play with the ball at his feet, taking possession and quickly turning into offense. And his size also makes him a target inside the area on set pieces and corner kicks. Verille is definitely one of the most experienced players in the Hockomock League this season. Playing in the middle of the pitch, Verille’s play often dictates how Canton will play. While he can drop back and defend, he can also carry possession forward and spring teammates in behind opposing defenses. And the more that he’s played at the varsity level, the more dangerous he’s become in the final third. While he wasn’t Canton’s leading scorer a year ago, his decision making often leads to good chances for the Bulldogs. After playing a good handful of juniors and sophomores during the 2016 season, the Bulldogs look to be an experienced group heading into this year. Leading the way will be senior and two-time captain Jake Verille, who leads the Bulldogs from the middle of the pitch. Fellow captain Abe Garber is back for another year in net and senior captain John Agnitti with anchor the defensive line. Verille, a HockomockSports.com Best XI selection last season, has been one of the top playmakers the past two years. On top of Verille’s offensive ability, Canton also returns junior Paul Corcoran – the team’s leading scorer (nine goals) and the HockomockSports.com Underclassman of the Year. Alongside Corcoran, the Bulldogs have a slew of juniors with varsity experience including Griffin Roach, Simon Cruz, Paulo Ruggeri and Avery Minkin that will all factor into the attack. After graduating just five seniors last season, head coach Joe Franchino brings back the majority of squad that had just one loss in its last eight regular season games in 2016. However, two of those five players – Anthony Barreira (two-time Best XI selection) & AJ Bubencik (now playing at Mass. Maritime) – were four year players and will be tough to replace. The good news is that while the Warriors were young a year ago, a good portion of the team has at least a season of varsity experience under its belt. Senior captain Shawn McNamara, now in his fourth year starting for the Warriors, will lead the way along with fellow captains Matt Rongione and Ryan Kelley. Senior Cam Cass also has plenty of experience and will be relied upon as a playmaker. Junior Shane Vandenboom had a strong sophomore season and will be an important piece in the midfield along classmate Nic Beigel and senior Hussiein Kafel. Seniors Bobby Harrison will be the starting goalie for the Warriors. The Scarlet Hawks are looking to take the next step in year two with Brian Edwards at the helm. After just four wins a season ago, Edwards is hoping that the experience gained by his younger players will translate into more success this time around. Midfielder Andre Oliveira will be a key piece for Edwards and the Scarlet Hawks, helping both the offense and defense. Oliveira’s ability to transition from defense to offense will be key for the Scarlet Hawks this season. On the defensive side of the ball, senior Jacob Balzarini is back in the center of the defense. After getting plenty of time in that spot last season, Balzarini will be the anchor of the backline this year. On top of Oliveira and Balzaini, Edwards is looking for new players to step up and make an impact. North Attleboro boasts over a dozen seniors on the 2017 version of the Red Rocketeers and head coach Geoff Burgess is hoping that experience will translate into success on the field. Leading the way will be senior and 2016 HockomockSports.com Second XI selection Gabe Pinhancos, who has been Big Red’s field general for the past couple of seasons. Josh Rodriguez and Ryan Pasquel are also back this season to help bolster the midfield. Junior Joe Hilf and senior Jeff Gale will be relied upon to pace North Attleboro’s offense. Big Red’s biggest strength could be in the back, having a defensive unit with plenty of experience. Noah Barney and Zach Matracia both saw significant time and will be joined by classmates Andrew Fontaine and Kevin Aguilar. That defensive unit will be in front of senior goalie Brendan Matracia. The defending Davenport division champs will boast a large senior class (14) but will also rely on some younger players as they look to win back-to-back Hock titles. The Eagles’ tri-captains will provide leadership in each part of the pitch, with senior center back Shubo Roy-Chowdury on the back line, senior Tyler Hippler leading the midfield and senior Spencer Hall up front. Sharon’s attack will bolstered by seniors Marques Benton and Andy Reyes-Jones, who both saw plenty of time up top a year ago. Meanwhile, sophomore Michael Baur is back after a standout freshman season and classmates Isaiah Stessman, Brian Higgins and freshman Brice Nathan will all play a role in helping the Eagles go forward. 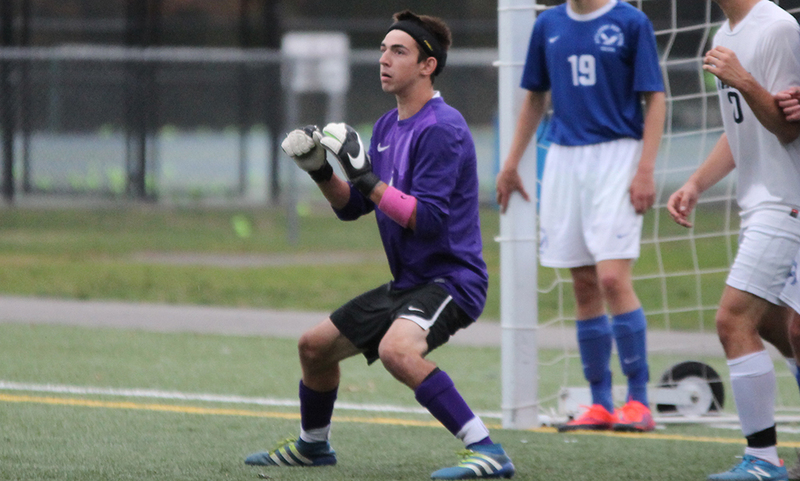 Maybe the biggest advantage the Eagles have is returning keeper Ethan Kantor. The junior had a terrific season in net a year ago and will be the backbone of the team’s defense. Stoughton will be looking to make it back again to the postseason, this time under first-year head coach Chris Suchorski. The Black Knights just made it in a season ago but it marked the third straight year for the program. Suchorski is tasked with replacing 12 seniors that graduated from last year’s team. However, all of the players he is returning all saw varsity time last season and that should soften the blow dealt by graduation. Senior Tyler Melo (six points) is back and will likely be a vital part of the Black Knights’ midfield and attack. Junior Fabio Ponce de Leon (six points) begins his third season on varsity and will once again be one the Black Knights’ top offensive options. Brian Peoples also returns as one of the team’s top playmakers. The biggest question could come with the back four, as the Black Knights must find a replacement for 2016 Best XI selection Goddy Fombe, who anchored the back line the past two season the sweeper position. Canton, 4 @ Stoughton, 4 – Final – Canton erased three different deficits on the road to get the point while Stoughton qualified for the state tournament with the draw. Jordan Asnes opened the scoring on a volley into the far corner off a cross from Brian Peoples. Canton leveled the game to send the teams into the halftime break at 1-1. Stoughton regained the lead after a great through ball from Asnes for a nice finish into the corner from Tyler Melo. The Black Knights made it 3-1 when Loubensky Lucas found John Ortiz in the six yard box. 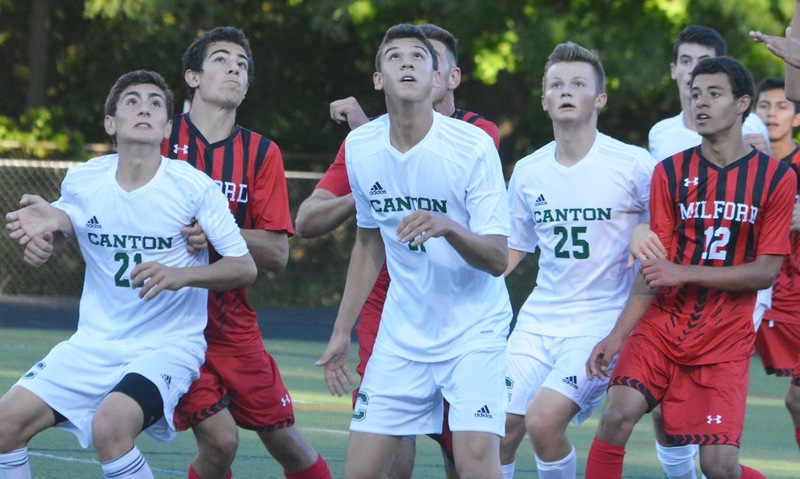 Canton responded with a pair of goals to level the match at 3-3. Stoughton responded instantly as Lucus lifted the ball over the defense and Marco Antunes finished nicely into the corner. Canton tied the game with just over a minute to play to finish 4-4. Milford, 0 @ Sharon, 3 – Final – Sharon built a 1-0 lead by halftime and added two more in the second half, going unbeaten against Davenport foes this season. Ben Stamm and Andrew Reyes-Jones each scored off an assist from Spencer Hall while Marques Benton found the back of the net off an assist from Oliver Hu. Canton, 3 vs. Quincy, 0 – Final – Canton finished the season with a 25-21, 26-24, 25-16 sweep against Quincy. Emma Murphy led Canton with nine kills and no errors, hitting .529. Nicole Poole had 24 assists and 20 digs while Casey Shea and Emma Gobbi combined for 14 kills. Oliver Ames placed sixth out of 13 teams at the MIAA D2 State Final, held at Black Swan Country Club in Georgetown, Mass.